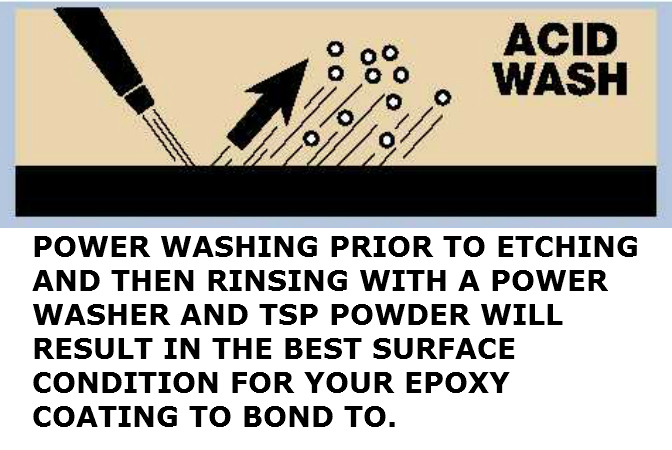 The most important thing to remember when applying an epoxy paint coating to any floor is proper preparation! We'll discuss everything you need to know about preparing concrete floors and applying several types of epoxy floor coatings. Spending 5 minutes on this page can save you a lot of heartache and money in the future. Be sure to read the FAQ Tab above also. It doesn't matter whether your floor is old or new or whether it's a garage floor, commercial floor or an industrial floor. It MUST be 100% clean of any contaminants and 100% dry. You will see this over and over again because we cannot over emphasize it enough. All of our garage flooring epoxies are ASTM pull tested prior to shipping and when applied to a properly prepared surface our floor epoxy will pull the top layer of the concrete off before separating from the concrete. That's why you also want a small can of Xylene(available at Home Depot) handy when applying any of our epoxy floor kits. You need to clean up any spills or splatters right away otherwise once our epoxy dries it can only be removed via grinding. When you're done with this page we have a great series of articles on everything about epoxy flooring. Just click on the NEED TO KNOW tab in the top menu bar and look under Epoxy Floor Coatings. It's also well worth your time to read those articles before you purchase and begin to epoxy paint any type of floor. Please keep in mind when you're reading all this information is that once you understand how to do the job right, it's very easy to do. The big mistake most people make is that they treat painting their floor the same as painting a room inside their house. They go to a local store, buy off the shelf epoxy paint and simply slap it on the floor. Then in a short period of time they have a complete disaster on their hands because the floor paint they applied was of poor quality and or the floor was not prepped properly. We want you to avoid having to go through a failed epoxy floor. It's the reason we offer all the different epoxy flooring kits we do and all the detailed information you'll see throughout the website. The First Video Was Made By A Couple Of High School Kids Applying Armor Chip Epoxy Floor Kit To Their Garage Floor. We like this video cause it shows how simple it really is and that anyone can apply an epoxy coating to their floor. The videos plus our detailed instructions and the information you read here will be more than enough for you to coat your floor like a professional. Next is a step by step video of an Armor II Commercial Epoxy Floor installation. A different product but you'll notice the concepts are the same. Towards the bottom of the page is a terrific series of images showing how to apply color chips evenly when using the Armor Chip or Armor Granite kits. For more detailed instructions see the APPLICATION INSTRUCTIONS tab on each product page. The Blue Links below will take you directly to each product page. We suggest you read this page first and then go to a product page for additional information on the type of epoxy coating you need or want. If you're unsure of anything please feel free to call or email us and we'll be happy to clear up any questions or concerns you might have. Armor Chip. 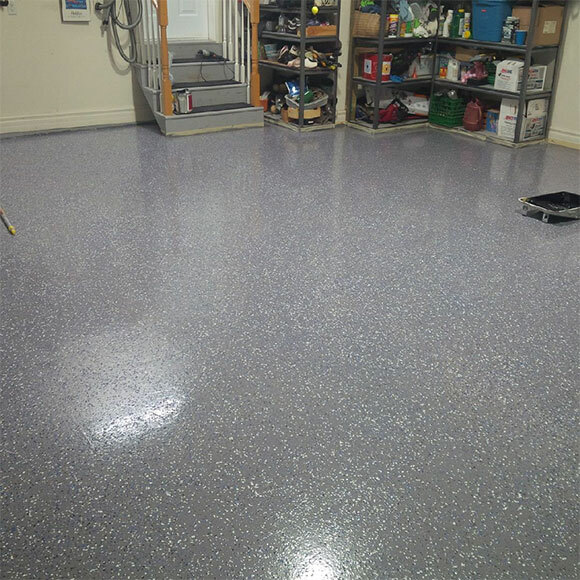 Our Garage Epoxy Floor Coating With Medium Colored Flake Coverage. Armor Granite. Our Top Of The Line Garage Epoxy Floor Kit With Heavy Flake Coverage For A Granite Look. ArmorGarage Ultra. 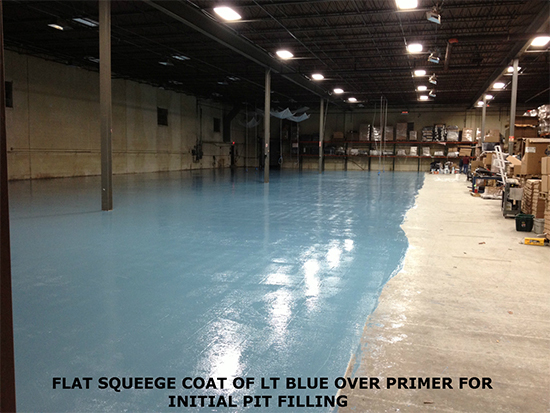 Our Super Heavy Duty Industrial Three Coat Epoxy Floor System With or Without Flakes. Armor II Commercial Epoxy Floor Coating. 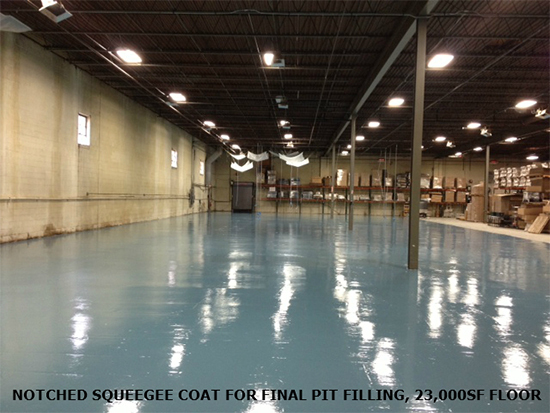 Our Commercial Heavy Duty Two Coat Epoxy Floor System Without Flakes. 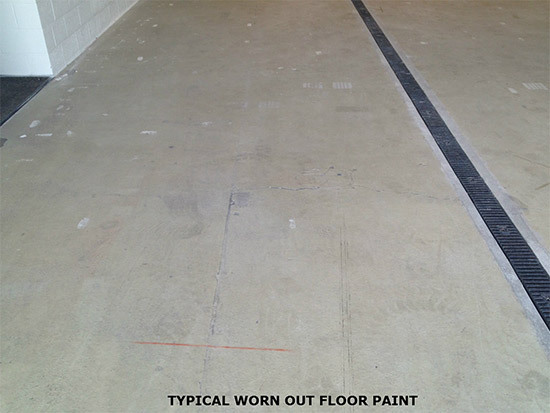 For custom epoxy flooring designs see the How To Custom Epoxy Paint Your Garage Floor page. 1. Temperature should be between 55-95 degrees and not raining, use small electric heaters if room temps are below 55 during curing process. 2. Wash the floor. For best results Power Washing is strongly recommended. 3. Etching is a simple and necessary step. Etch the floor with provided etching solution. Be sure to scrub the solution into the entire floor! Use a degreaser to remove any oil or grease stains, for stubborn oil stains you can use Liquid Tide Detergent scrubbed in with some of the acid etching solution. Your Garage Floor should be completely clean, dry and have a slightly rough finish. Re-etch a second time if necessary to get the floor completely clean. New floors should be etched a second time with a more diluted solution. New floors have a lot of curing residues at the surface that need to be completely cleaned out. Let your floor dry for 1-2 days. Your floor should look like this when done, clean with no dirty or dark spots. 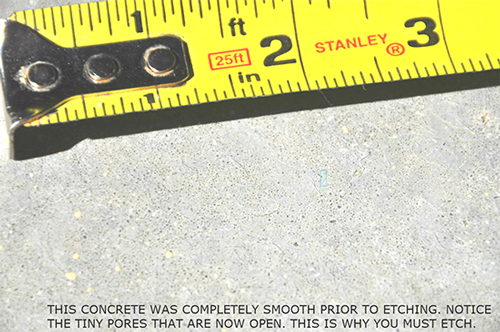 Those opened tiny pores allow the epoxy to penetrate into the slab and lock in for an unbreakable bond. If your floor is older or very dirty you may need to re-etch a second time. 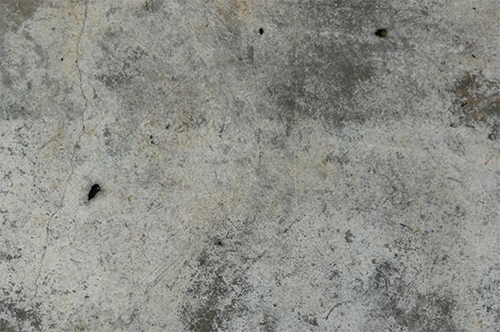 If your concrete is light in color there should be no dark spots, if there are, then re-etch. If you use Muriatic Acid, sprinkle a box of TSP onto the floor after the acid has stopped fizzing, scrub it in and then rinse off. Again a power washer is strongly recommended to do the rinsing. The TSP powder will neutralize the acid and bring the slab back to the proper PH. This will enhance the bond between the epoxy and the slab. If your floor is very old and in poor condition we recommend you rent a floor grinder and use our garage floor epoxy primer first. This is how your floor should look like prior to coating with any type of floor epoxy paint. If your floor looks like this STOP and power wash and etch again! This floor is not ready for an epoxy coating! If you are grinding your floor it is still recommended that you etch the floor since you'll be rinsing off the last bit of dust from grinding, this will ensure the concrete pores are clean and open. Our garage floor epoxies are specially formulated to form a permanent molecular bond into those open pores. 4. Tape floor at inside edge of door. Us e a good quality duct tape. We do not recommend applying the epoxy past the door. 5. Mix Part A First with provided power mixer. 6. Measure parts of "A" & part of "B" according to the mix ratio on the label and mix together. Mix until all streaks have disappeared. Epoxy should be a uniform color. This is not like store bought epoxy so DO NOT mix all of our epoxy at once as you would other types of off the shelf epoxy. Our 100% pure floor epoxy works on catalytic reaction and so the more you mix the more reaction you get and the faster it cures. Do not mix more than one gallon of epoxy per person rolling. Follow the guidelines below as you do the floor in sections, all the sections will blend together for a beautiful seamless monolithic finish. If for some reason you decide not to read or follow the instructions this is what will happen in about 5 minutes! 7. When using the Ultra Military grade epoxy, Armor Chip or Armor Granite pour epoxy directly from bucket onto floor and squeegee out evenly with notched squeegee & then back roll over it with our supplied roller(s) for final spreading and smoothing. Optimal section size when using color flakes is a 4 foot wide strip unless you're using the spike soles in which case you can do a much wider strip. When doing the Primer for the Ultra Military System a roller is all that is needed to apply it. Same for the base coat and topcoat for the Armor II system. The reason being is that these coatings are thinner and can be applied using a roller pan and the supplied rollers. Each coating must be applied between 6 and 24 hours of the previous coating. Pot life is about 45 minutes which is more than double the time it should take you to do one section. So no need to panic or rush when doing the proper size batches. We would do about one gallon of mixed epoxy(Part A & Part B combined) for each person rolling. For larger garage floors there should be one person dedicated to just mixing and then he can disperse the mixed epoxy into each person's individual pail for application. If you get the epoxy on anything you don't want epoxied, wipe off immediately with some Xylene(Lowes), otherwise once dried you will have to grind it off. Purchase a set of spiked soles to do larger floor areas and make applying the chips easier. Spike soles are included in Armor Granite kits and the Military Ultra kits of 1500 sf and larger. 8. Disperse the decorative chips(if using)evenly in small amounts for best results. DO NOT throw too many chips at once, if you do you will have clumps and piles of chips which will detract from the beautiful high gloss finish. Best method is to toss a little at a time and fill in with pinch fulls of chips as needed. This is where the spikes really come in handy. They allow you to walk right in the epoxy up to a bare spot and fill in. Make sure to also leave a wet edge with no chips so that when you mix the next batch of epoxy you slightly overlap the wet edge. This will reactivate the epoxy on the wet edge, sprinkle chips and the the epoxy will all blend and self level into a solid monolithic coating. Repeat steps 7 & 8 until entire floor is complete. When the garage floor is dry scrape chips to remove any chips sticking up and then Vac up all the loose chips. Here's a series of images sent in by a customer who came up with a simple but yet very effective way to spread the chips out evenly. As you can tell by the pictures he did a perfect job with the chips. This is how he told us he did it. NOW FILL THE CONTAINER HALFWAY WITH CHIPS, HOLD CONTAINER SIDEWAYS UNTIL YOU ARE IN POSITION THEN TURN CONTAINER UPRIGHT SHAKE CONTAINER WHILE WALKING IN THE EPOXY WITH YOUR SPIKE SOLES(MUST HAVE THE SPIKES). THE CHIPS WILL NOT COME OUT UNTIL YOU START SHAKING AND THEY WILL FALL STRAIGHT DOWN OUT OF THE CONTAINER. ONCE YOU'VE DONE A SECTION TAKE A STEP BACK AND LOOK FOR BARE SPOTS, IF YOU HAVE A SECOND PERSON THEY CAN ACT AS A SPOTTER. FOR BARE SPOTS JUST WALK UP TO THEM AND ADD A PINCH OF CHIPS WITH A LITTLE SHAKE OF THE CONTAINER TO FILL IN. WE DON'T KNOW ABOUT YOU BUT WE THINK THIS METHOD RESULTED IN A BEAUTIFUL CHIP PATTERN THAT IS AS GOOD AS IT GETS. THE ARMOR GRANITE KITS INCLUDE A PAIR OF SPIKED SOLES, WITH ARMOR CHIP THEY ARE PURCHASED SEPARATELY. We get ask a lot about filling in control joints. Our recommendation is that you don't fill them in unless the sight of them make you physically ill and your floor is at least 10 years old. Those joints are there for a reason and they will keep a crack from forming right in the middle of your brand new high gloss garage epoxy floor. Below is a close up image of what a control joint looks like after it's properly epoxied. There's also an image from further back. As you can see the finished control joints look nothing like an unfinished one. Once finished they give the floor more of a stone slab appearance. All you need to do is lightly feather the epoxy in and out of the joint and lightly sprinkle chips on both sides of the joint. This is a good shot of what we call leaving a wet edge. Notice how the flakes are stopped about 6"-12" before the edge of the floor epoxy. This way you can apply the next batch of epoxy and slightly overlap the wet edge without getting the flakes on your roller. 9. After applying the base coat of which ever kit you've purchased, allow it to dry to the touch, usually in about 6-8 hrs then apply the next coating whether it be epoxy or topcoat. You can also wait till the next morning to apply the next coat. For best results don't let more than 20 hrs pass between coats. For the final coating apply the topcoat with provided non skid additive. When using Armor Chip or Armor Granite that have multiple topcoats apply nonslip additive in the final coating. Allow first coat to dry before applying second coat. Be sure to keep stirring the topcoat to keep the nonslip from accumulating at the bottom. Always use a roller pan when applying topcoat with nonslip additive in it. Pouring the topcoat directly onto the floor will result in concentrated amounts of nonslip to accumulate causing dull spots. If you purchased the optional military grade topcoat for Armor Chip or Armor Granite you only have to do one coat(DO Not Apply Two Coats Of The Military Topcoat) so you mix the nonslip additive right into the can. Ultra and Armor II only get one topcoat also. You now have a better quality floor than a professional company would apply and at a fraction of the cost! 10. Wait before you park your vehicle on a new epoxy flooring job. Q: Do I need to grind my floor to apply an epoxy coating? A: Grinding is great if you have the right equipment. Grinding is sometimes necessary, if you are running heavy equipment such as large aircraft, buses, 18 wheelers or fire engines on the floor we would recommend you get the floor professionally grinded. Listen to us, we know what we're talking about since we have one of the largest floor grinding businesses in the NY/NJ area. Grinding can be done if you have a good heavy duty grinder with a vacuum system designed for that grinder. A shop vac is not s suitable piece of equipment to handle floor grinding, they will clog in two seconds. Real grinding vacuum systems have super high capacity filters with automated pulsing devices that shake the filters clean when they start to clog. Add on Do-Hickies available at some home improvement stores are of little benefit. The floor prep machines at Home Depot are perfect for roughing up an existing coating you want to paint over or removing one of their coatings. You can also use it for a light surface pre cleaning if your floor is really old and dirty prior to an acid etch. We strongly recommend against wet grinding, the mess and stains from the slurry are horrendous. If you use the floor prep machine for what we recommended above you will have a manageable amount of dust. Wear a respirator and sweep up as much of the dust as you can when you're done. You can keep sweeping until all the dust is gone or you can rinse the floor down after you sweep up the initial major piles of dust. Rinsing will save you a lot of sweeping and cleaning time After the floor is dry, rub your hand along the floor, no dust should be on your hand. You can also use a piece of duct tape to test for dust. If dust is still present this is where a good leaf blower comes in handy. It's easy to see from the above image why a shop vac even with some on add on device would not be sufficient for a heavy grind. A heavy grind is needed when your floor is in poor condition, very old and very very dirty or if you are running a lot of traffic with very heavy weight. This is when you need good professional equipment to get the job done in a timely manner. 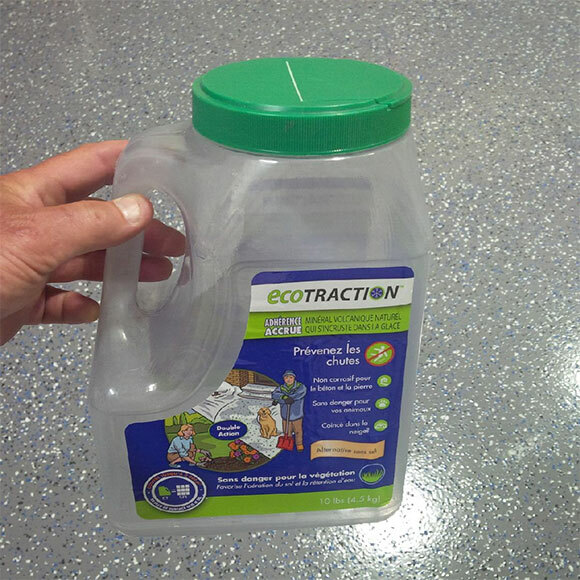 Floor Prep machines and add on vac devices are ok for a light coating removal or light surface scraping followed buy a good acid wash and power rinse with TSP powder. For 90% of residential to medium duty commercial floors using a floor Prep machine and good acid etching will do the job. For heavy commercial or industrial floors or ANY floor that's in bad shape go with a heavy grind. So to sum up, if you just need to remove a cheap coating that's peeling off or just want to scratch the floor clean a little, use the floor prep machine from Home Depot. If you need to really grind cause your floor is very old and very dirty, you are running very heavy traffic loads or very high traffic volume or you need to remove a previous coating that is still adhered to the floor or your floor is very large and can't get it wet. Make sure you get the biggest grinder you can handle with a set of 20 grit blades, preferably new. A good grinder will require a 220 volt connection or have a large gas driven engine. Make sure you get the vac system that has the capacity to handle that grinder! Please note that no matter how good a grinder and vac system you get you will still have to clean up some dust manually. If you don't have a decent tool rental place by you don't rent a piece of junk, you will be grinding forever and killing yourself at the same time. In that case you're better off hiring a professional company, they charge anywhere from .70 cents to $.90/SF. For the majority of floors a good acid etch and neutralizing is all you need. If you're not sure about what to do, give us a call and we can guide you on what's best for your floor. Q: Should I shot blast my floor for an epoxy coating? A: Shot blasting should only be done on industrial floors that are in the worst condition. Do not try to shot blast yourself. A good shot blasting company will charge .30-.50 cents a sf. Just be informed that shot blasting will more often then not cause what we call lawnmower lines in the epoxy finish. As the shot blasting machine overlaps each strip the tiny pits in the overlapped areas are deeper then the non overlapped pits. So when you apply any epoxy coating over it the deeper pits have more pigment in them and show up as dark lines in the epoxy. Shot blasting is great cause it's inexpensive and fast but just be aware that if final appearance is of critical importance grinding is the better way to go. Q: How long do I wait in between a Primer and Epoxy? A: Our Primers will dry to the touch in about 5-7 hours. You want to apply the next coating after it's dry to the touch and within 24 hrs. Same goes for any coatings being applied over another coating such as a final topcoat. Wait till it's dry to the touch in 5-7 hours and recoat within 24 hrs. After 24hrs you must rough the surface up with 120 grit sandpaper to make sure the next layer will adhere properly. If you are doing your floor in sections make sure you leave overlap strips and lightly sand them so that when you complete the next section it will adhere to the previous section when you overlap the coatings. Q: Should I fill in my control or expansion joints? A: If your floor is fairly new the answer is no. You don't want a crack to show up in the middle of your brand new high gloss epoxy floor! If your floor is older than 10 years it's most likely done settling so you can use our crack and joint compound to fill in control joints(saw cuts). If your joints have a material or wood in them, then they are expansion joints and you need to use our flexible joint compound. Just to let you know that if you just feather the epoxy in and out of the joints it will give the floor some dimension especially if your doing a color chip finish. The sections of finished concrete will look like terrazzo slabs. But if you absolutely cannot bare the sight of lines in your floor then use one of our compounds or a good quality compound you can get locally. Whatever you do please do not use some cheap premixed stuff in a tub from your big box store. It will only crack and chip out of the joints ruining your beautiful finished floor. Q: My floor is rough and very pitted how can I achieve a nice finish? A: The two images below are of a floor that had a previous water based epoxy on it that did not fill the pits due to its thinness and was failing prematurely as most water based epoxies do. The owner decided to redo the floor with our Ultra Military System. After prepping the floor, he applied one coat of the primer. Then he applied one coat of the high build Light Blue epoxy with a Flat Squeegee pressing down firmly so that the squeegee pushed material into the pits while leaving a very thin to no coating on the high points of the surface. Next he applied a second coat of the high build epoxy with the notched squeegee and then back rolled it. This completed the filling process and created a thick smooth finish. Final coat was the Military Grade Clear Topcoat for abrasion and wear resistance. Please note that doing these floors is not an exact science as far as knowing exactly how much of the epoxy you will need. Since coverage will vary greatly depending on the severity of the pitting. We suggest you contact us whenever trying to coat a badly pitted floor. Q: How difficult is it to apply your epoxy paint and how long should it take. A: Our kits are designed to make it very easy to apply our epoxy coatings and achieve a professional looking finish even if you've never done this before. All our epoxy floor kits come with everything you need to do the job right. They also come with instructions that are very detailed and easy to follow. Plus we provide unlimited support 24/7 should you need any help. The hardest part is usually getting all your stuff off the floor and out of the way so you can apply the epoxy coating to it. Working times for a typical 2 1/2 car garage are approx 2 hrs for cleaning and etching, 2 hrs to apply epoxy and chips and 2 hrs to apply topcoats. That's it. Q: What is the purpose of etching and do I need to power wash my garage floor? A: Power washing your floor prior to etching will yield the best results. 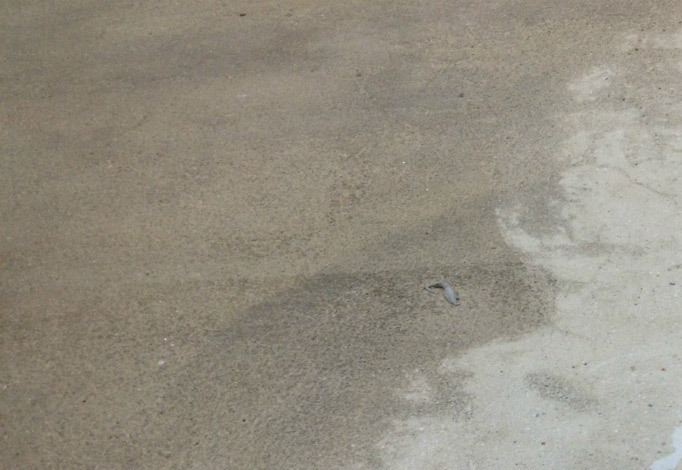 Etching cleans out ground in residues and opens up the pores of your concrete allowing the epoxy into the concrete forming a permanent bond. Etching should be done after you power wash and the floor is still wet. Please note if your floor is stained with oil & grease you must use a good degreaser to remove these stains. Etching will not remove them and the floor epoxy will not adhere to stained areas. The ideal condition of your floor should be absolutely clean, dry and have a rough texture to it similar to an emery board when you rub your hand across it. If your floor was polished smooth it may be necessary to etch a second time. You need to etch your floor no matter what size it is and especially if it's brand new. On brand new floors you get a lot of curing residues that float up to the surface. We recommend you do two good etchings and neutralize with TSP powder. If you diamond grind it's not a bad idea to use etching solution during the rinse off. Since the floor is wet you might as well etch it as you are rinsing off the dust from grinding. A power washer works best for doing the rinse off after grinding. Grinding is good for getting down to clean concrete but it's the etching that opens up the pores. Q: When should I repair the cracks in my garage floor. A: If using the crack and joint compound, repair the cracks and let it cure overnight then clean and etch the floor. If using the ready crack repair kit, clean and etch the floor first and let dry, then fill in cracks with repair kit and apply epoxy. You don't have to wait for the ready crack compound to dry. See our Crack Repair Kits HERE See this image of a typical floor crack that was repaired with the Crack & Joint Compound and then ground smooth with a grinder. Also notice the difference between the clean concrete and dirty concrete. This is another example of what your floor should look like prior to applying an epoxy coating to it. Q: Should I remove all of the old garage paint off my floor? A: You should give it a high pressure power wash and scraping to remove as much as possible. If the old coating flakes off from the power washer it means it is not properly bonded to the concrete and you should remove it entirely. If only small portions come off then use our special primer to coat over the remaining coating after you properly prepped it. See the photos below for what your floor should look like. This was a large auto dealership floor that had a typical low grade epoxy on it with a high abrasion loss rating, see our Epoxy Comparison Chart page for an explanation of Abrasion Rating and why it's important that your epoxy has the lowest Abrasion Loss rating possible. 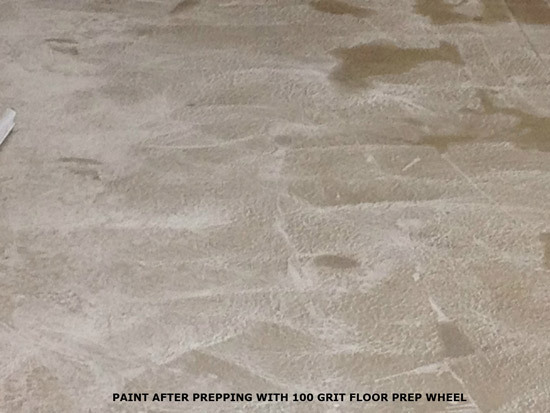 The Floor Prep Wheel with 100 grit teeth was used on a buffing machine to prep this floor in a couple of hours. If you are a longtime customer of ours and need to refresh your floor you will need the 25 grit teeth to effectively scuff the topcoat. Small floors can use a standard black pad on a buffer but for larger floors you need the Floor Prep Wheel to get done in a timely manner. Prepping the floor in this fashion and then priming with our special bonding primer will ensure a proper bond between the old coating and our epoxy. See below to purchase one of our Floor Prep Wheels. Q: Can I coat over a garage sealer on my floor? A: No. You must remove the sealer entirely. Use a 2 gallons of water to 1 gallon of Muratic acid solution for every 250 square feet of floor to remove the garage sealer. Sprinkle solution over a wet floor, scrub in and let sit for 5 minutes and rinse off. Do the floor in sections and try to avoid rinsing solution over a previously washed area more than once. This will avoid over etching of your floor. 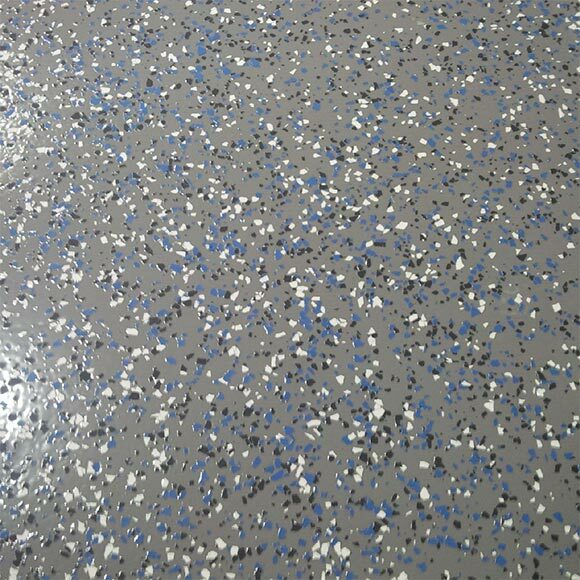 After using Muratic acid sprinkle TSP Powder over the floor after rinsing has been completed and while the floor is still wet. Brush in with stiff bristle shop broom and then rinse off thoroughly this will neutralize the acid in the floor. 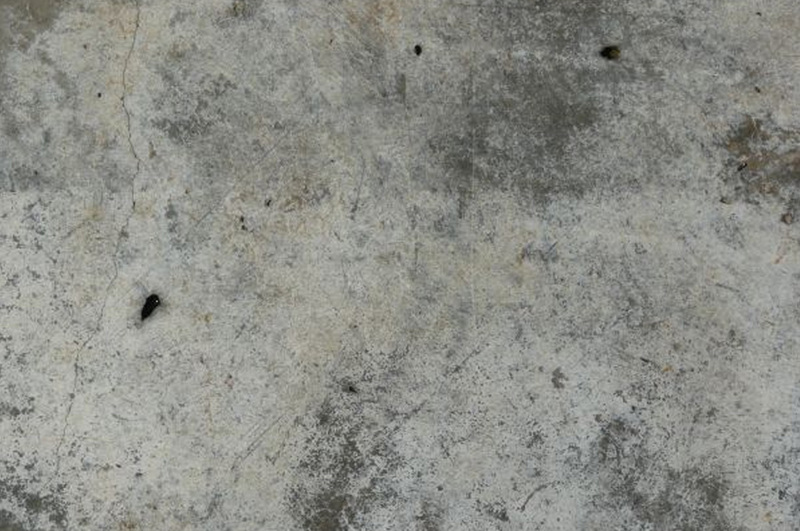 When done let floor dry and sprinkle water on it, if the water is absorbed into the concrete quickly then the sealer has been removed, if not, repeat the acid washing steps above. If the floor was sealed with a good industrial grade sealer Acid may not be effective. You will need to use either a black pad or our one of our Floor Prep Wheels to remove the sealer. Q: Whats the best way to apply the epoxy chips? A: Take a small amount of chips and toss them up the air at a 45 degree angle away from you allowing the chips to randomly sprinkle down onto the epoxy. Applying small amounts of chips at a time allows you to gradually fill in the floor in an even pattern for a beautiful finish. 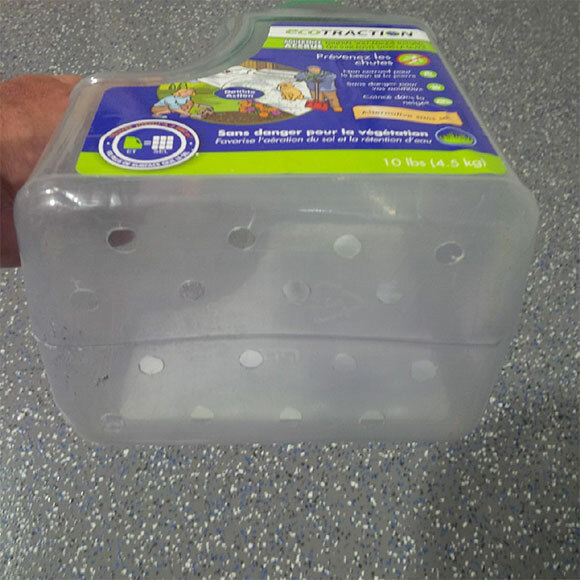 Also see the method of using a plastic jug on the main page. In our opinion it doesn't get any better than the customer's floor who came up with that idea. Q: How long should I let the floor dry after cleaning and etching? A: We recommend minimum of 24 hrs and preferably 48 hrs. You don't want any hidden moisture in the floor when you apply the epoxy coating to it. It will lead to spot failures some time in the future and you will be scratching your head why. Q: Can I apply the epoxy out past my garage door? A: We recommend that you stop inside the door but if you go 1-3" past the door its ok but we can't guarantee it. The constant exposure to the sun and elements will eventually cause damage to the high gloss finish. Q: I purchased the upgraded military grade topcoat, do I still need to do two coats? A: No. You only need to do one coat with the military grade topcoat. Two coats are not necessary and we actually recommend against it. The military grade topcoat is a super hard nonstick finish. Nothing likes sticking to it, not even itself. If you have to do two coats then you need to sand in between coats to make sure they bond together. But that should be the rare exception, one coat is like liquid steel on your floor. If you happen to wear it out then you can apply a new coat at that time. Q: Can I apply the epoxy and chips to the curbing around my perimeter walls? A: Yes. You can brush on the epoxy to the curbs and then apply the chips. You should do your curbing first, then the floor. When doing perimeter curbs please allow an extra margin of safety material wise since curbing typically absorbs more paint than the floor. You can sprinkle a line of chips on the floor and kind of puff them up onto the curb with a leaf blower. Several customers have told us this method worked great for them.